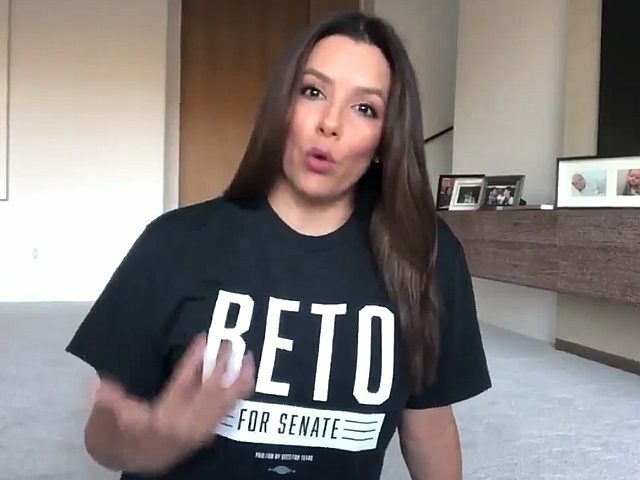 Actress Eva Longoria is the latest Hollywood elite to jump onboard Texas Democrat Beto O’Rourke’s campaign for Senate in Texas. “My story and my success are signs that the American dream can work – that hard work and education can be rewarded,” she continued. “And that this idea can work for Latinas like me and you,” she added. Beto O’Rouke, who has not suffered from a lack of support from Hollywood, recently welcomed the endorsement of country crooner Willie Nelson. The “Always On My Mind” singer hosted a fundraiser for the Democrat late in September. Some of Hollywood’s loudest activists have streamed into Texas to support O’Rourke’s campaign to unseat Senator Ted Cruz. O’Rourke’s “carpetbagging” Hollywood supporters include actress Rosie O’Donnell, Star Wars: The Last Jedi director Rian Johnson, 22 Jump Street director Phil Lord, former Netflix talk show host Chelsea Handler, producer Joe Rogen, and more.